Bayer Leverkusen haven’t been too impressive in the opening exchanges, sharing spoils with CSKA Moscow and Monaco, while they were beaten by Werder Bremen at the weekend, meaning they could face problems against in-form Tottenham. Spurs, on the other hand, recorded a 1-0 away win over CSKA Moscow, while also impressing on domestic stage, and it is, therefore, important to note that they are now available at 12/1 (13.0) special price to win at Bay Arena. All you have to do is sign up through this link and enter promo code ZFBCNP. 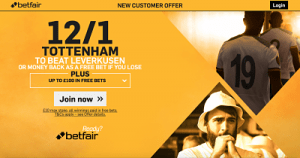 Then bet on Tottenham to beat Leverkusen in the Match Odds market at the enhanced odds and you will qualify for the special price as well as another £100 in free bets.